This is a fun cake that I made for my daughter's best friend. It was a "girls only" birthday party in which they celebrated at a 1950's dinner theater. The girls loved the movie "Grease" so much that I decided to combine the 50's and of course her favorite color blue! It is actually very easy to make and all the supplies that are mentioned including fondant, cake drums, pearl dust, gel colors, baby shoe cutter, gumpaste, royal icing, square cutter, flower cutter used for belt buckle, and pans can all be found at almost any cake supply shop or on-line. I baked 2 chocolate cakes both in a cake pan measuring 12x18x2. Any size pan will work depending on how large you would like your dress to be. I froze my cakes prior because I found that they are easier to carve into any shape if still slightly frozen. Once frozen, I carved one of my cakes into a blouse shape and the other cake into a poodle skirt shape. I had two separate cakes at this point in which I torted and filled with chocolate frosting. The outside of the blouse cake was iced with white buttercream tinted a skin tone color and the skirt cake was iced in a white buttercream. I then covered my cakes in rolled fondant in which I colored to match the birthday girls request. Before applying fondant to the blouse, I cut out a v-shape in the white fondant so that you could see the skin tone buttercream underneath the neck. Later, the fondant scarf will cover the outside of the v-shape to give it a more polished look. Both cakes were then put together on a large round cake drum to create a full dress. The cake drum was covered in black and white rolled fondant square pieces that I had cut with a square cutter a few days beforehand. The square pieces were attached to the cake drum with a dab of royal icing and placed to create a checked floor effect. I then hot glued a piece of ribbon around the cake drum for an extra special touch. Once the fondant covered cakes were on the drum, the fun part was to decorate with more fondant pieces that I had already made in advance. The emblem on the blouse was made using rolled out gumpaste and shaped into a letter shape, painted with color and sprinkled with edible blue sparkle. The belt, poodle (which I used piped royal icing to create the fur and pearl dust for a shine on the legs), scarf, slip ruffles, and pearl buttons (which were rolled in a little bit of pearl dust) are all fondant. The saddle shoe and record were made a week in advance to let air dry. I used a baby shoe template cutter for the shoe. You can even find a free printable baby shoe template searching the internet. The saddle shoe pieces were "glued" together with royal icing and designed the way I wanted. The shoe lace is also fondant. The record was made out of more colored fondant and the writing on the record was made using royal icing. To give the fondant belt and record that extra shine, I painted over the black fondant with black color mixed with a drop of lemon extract. Lemon extract or clear alcohol is used instead of water in painting on color because the alcohol dries the paint. If you were to use water for painting on color, you would just melt your pieces. Once you have all of your supplies, this cake is a really fun and exciting project that I am sure anyone will have fun making!! This Cakes a Cutie ! Sounds like it takes some patience putting this cake together but the results look great. 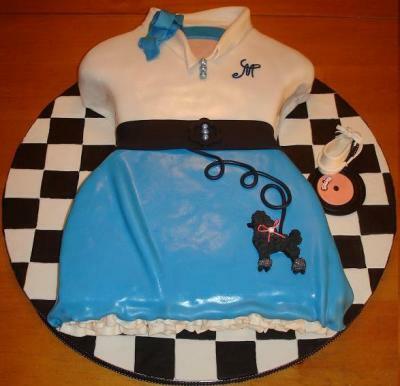 You can even change the icing color to match the Birthday Girls outfit or poodle skirt. I'm going to give it a try. That's just too cute to eat! The cake looks great. I love the 50's look so I really love this cake. I wish you would email me at Kimberlyrivers06@aol and give me the details on how you made it shiny. This cake is amazing and thanks for the detailed description, especially the tip about using lemon extract in painting on color. Thanks so much for sharing this cake!